So my parents got a knive set from St. Moritz, and wanted to give them to me. I'm an hobby cook, who just likes cooking simple stuff. I have barely any knowledge about knives or treating them, so here I am. I just had some questions about the knives, since I'm not sure if these are legit. Whenever I google the knives, I only get shady sites and stories about people being scammed. Is this brand legit? The booklet that's included says the entire set is worth around 730 euros, but I can't find anything online. 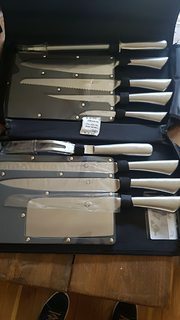 And assuming the knives are legit, are there any tips on treating/using them? Can these be put in the dishwasher when cleaning, or should I refrain from that? I have a magnetic bar on my wall to store knives, but is it bad to put 'good' knives on them? They are kind of blunt at the moment, but I have barely any experience sharpening them, should I bring them to a special shop or something? Thank you for your help! Just figuring out how to use these, if they're legit to begin with. "San Moritz" is the name of a line of culinary knives by the well recognized brand Messermeister. HOWEVER, the knives shown differ notably in design from that line and are likely a cheaply made product trying to capitalize on the name of that line. Knives that are actually sold aboveboard (and perfectly worth the money) at ~$100 and higher apiece will usually be of a well recognized brand (eg Herder, Zwilling, K Sabatier, Chroma, Global...), or small-batch/handmade pieces bearing the name of the artisan or responsible workshop leader (eg Heimo Roselli, Jürgen Schanz, Sirou Kamou...). Often (with a legit expensive knife), the steel type used will be clearly named (either by an industry standard name like VG10, 1.4116, 420B, AUS-8A .... or by a manufacturer-specific product name that describes a combination of steel and proprietary heat treatment method, eg Global "Cromova" ), and sometimes the hardness range will also be specified (eg 60-62HRC would be typical for VG10, 55-56HRC for 1.4116). A steel type and hardness do not signify the quality of the steel alone, since the way the steel is processed makes significant differences. A cheap knife is likely going to be of 420B at 55-56HRC, which CAN be a decent steel but often is not. Out of the box sharpness is a highly brand dependent matter in all price ranges, for different reasons - a very cheap brand might not bother to sharpen well since it is costly (good abrasives are not that cheap), a high end maker assumes that the user is knowledgeable and will either know sharpening it or know a trusted local professional, and have their own idea of HOW they want it sharpened (there are tradeoffs to be made in sharpness vs durability, and different edges are best for different applications). BTW, for culinary knives, cutting behaviour is a combination of actual edge sharpness and blade geometry. Over priced. Hot drop forged from a single steel. A better not great knife. Check the fork first. Can it lift ham with out bending? Forks are needed for lifting meat. The blades. All should know how to use a stone to sharpen. Takes practice but not hard to do. Start with a dull flat file about 6 inch's. Then your medium stone flat. Then your fine stone. Next you Onix stone to polish the blade. When you can dry shave the hairs off your arm perfect for use.